Ready to Play Ukulele but Confused with All the Choices? 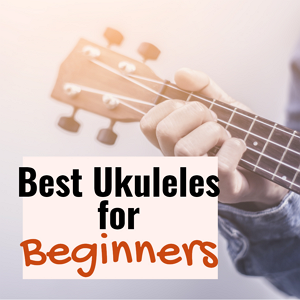 In this article, I will guide you through the different ukuleles sizes, how and why they sound different, and how to choose and ukulele that will work for you. First and foremost, there are many ukulele sizes and each produces a different sound. Here is a simple rule not only for ukuleles but for all musical instruments, the smaller the size of the body the higher sounding the timbre. When I say higher timbre, I’m not referring to volume, although many of our ears perceive a higher timbre as sounding louder, but simply that a sound has more treble (higher timbre) or more bass (lower timbre). For example, a soprano ukulele size, one of the smallest ukuleles, produces a high timbre because the body is so small. On the other hand, a baritone ukulele size, one of the larger ukuleles, produces a much deeper and low sound. For today let’s keep it simple and concentrate on the 4 most popular ukuleles (from smallest to biggest): soprano, concert, tenor, baritone. The soprano ukulele, which is referred to as the “standard” was the original ukulele size and ordinated in the late 1800’s. The concert ukulele which is slightly bigger and deeper in sound developed in the 1920’s. Next came the tenor which produces even more volume and deeper tones and followed by the baritone in the 1940’s which is the loudest and deepest of them all. Today, there are many ukulele companies making many different sizes, shapes, and colors of ukuleles that it can be hard to know what size a ukulele is. 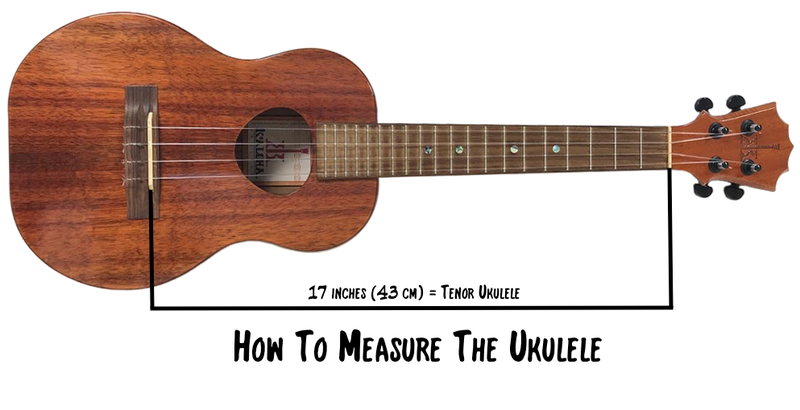 The easiest way to determine the size of an ukulele is to measure it. 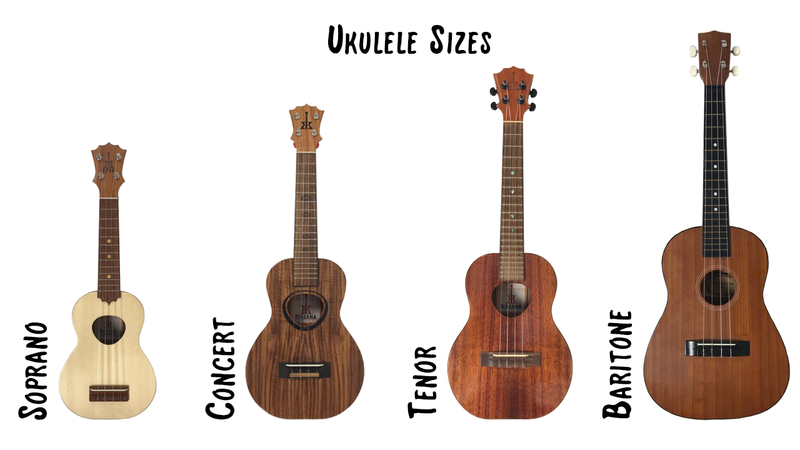 How do you measure ukulele sizes? It’s simple, just measure the ukulele is from the bridge to the nut. Over time and with experience you’ll be able to tell the size of an ukulele just by seeing or holding it. There are a few things you need to know when choosing an ukulele. First, the soprano, concert, and tenor ukuleles all use the same tuning: G – C – E – A. The baritone ukulele uses a different tuning: D – G – B – E.
Unless you specifically know that you want or need a baritone ukulele, I would stick with the soprano, concert or tenor. 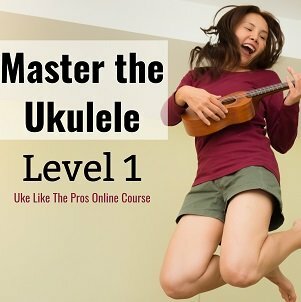 Most of the ukulele lessons you find online or in books are written for the soprano, concert and tenor. Second, choose your ukulele that feels right for you. If your 6 foot 5 inches and have huge hands a soprano instrument will probably be a bit small for you. When you go to a ukulele store, simply pick up each ukulele and hold it, even if you don’t know what to do, and determine how it feels with your body and hand type. Third, determine what you want to do with the ukulele. If you just want to strum the chords to your favorite songs, then a soprano or concert ukulele will work great for you. If you goal is to play scales and move up and down the ukulele neck like Jake Shimabukuro, then a concert or tenor ukulele will work best for you. Remember that the smaller the ukulele size the smaller the neck which can limit what you can do with it. Fourth, the type of wood used to make your ukulele will determine its price. Traditionally ukuleles from Hawaii are made from Koa wood, which only grows on the Hawaiian Island. Although, Koa wood produces an amazing, warm, and rounded tone, it is expensive. Since the demand and price of Koa wood has sky rocketed you are seeing more ukuleles made from spruce, cedar, rosewood, acacia, and laminate. Many ukuleles that are under $200 will be made from a laminate wood. Even though an ukulele made from Koa and one made from laminate may look the same, they are not. You get what you pay for. Yes, to get started a $150 ukulele may look and sound great to you, but you will hear and feel the difference when you move up to a quality hand-made ukulele made by companies such as KoAloha, Kamaka, and Kanile’a. My suggestion is to buy the most expensive instrument that fits your budget. This is a great time to be an ukulele player. The ukulele is extremely popular and lots of companies are making ukuleles, so they are easy to find and afford. Now that you are done with this article go get your ukulele and play. You mention that “the smaller the size of the [ukulele] body the higher sounding the pitch.” But isn’t “pitch” the frequency of a note? I’d think the pitch of a soprano would be the same as the pitch of a tenor (i.e., the C string on both ukuleles play the same “middle C” note). Thanks! Steve great point you bring up, yes the pitch of the tenor and the soprano would be the same, the proper word to use would have been timbre. Thanks for reading. The guide is just plain WRONG. You will get more bass if you use a low G string, but the relative pitch of the key it’s tuned to is identical. And if you use a regular re-entrant G string then it’s 100% identical. The baritone (in standard tuning) is the one that genuinely get’s lower in pitch. Facebook, YouTube and now on the website, you are thorough. I agree, as I have already stated with other comments that the word timbre would have caused less stress among people then pitch. Yes the tuning was a typo which is being corrected. As far as your point in #3 is that is that although yes some people that are 6’5″ can play sopranos a majority of them find it easier to play an instrument that is bigger and has a longer scale, I have many students that fall into this category. Yes some players like Andy Eastwood play melody and scales on the ukulele, the majority of players find it easier to play a bigger ukulele. I notice that Jake Shimabukuro and Taimane Gardner don’t play sopranos. As far as your comment that “The guide is just plain WRONG.” This is not true. You disagree with some of what I say and that’s fine but I stand by what I say. Nothing in music or life is 100% this way or that way. I’m glad you have an opinion and like to share it, but don’t always assume everything you say is 100% correct.